After captivating players from all around the world with the mythic Runaway trilogy, Pendulo Studios presents a new adventure gaming masterpiece! This thrilling mystery, presenting a unique, dark and somber style, will not leave you indifferent! 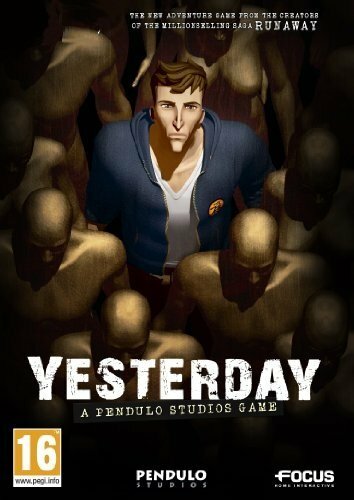 With an incredible story, superb environments, perplexing and shady characters, Yesterday throws you into an unforgettable adventure from which you will n... See moreot emerge unscathed. New York in 2011��� Homeless people are disappearing one after another, their bodies found lifeless. Meanwhile, a Y-shaped scar appears on the hands of seemingly unrelated people. Henry White, a young and rich heir dedicated to a charitable organization, and his friend Cooper, are the first to investigate. They will soon cross paths with the enigmatic John Yesterday, whose memory seems to have been wiped clear, and who will find himself dragged into this incredible story! How far will you go to discover who John really is, and what he did��� Yesterday?